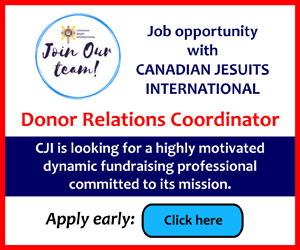 OTTAWA - Campaign Life Coalition has paved the way for every organization fighting for the unborn to take part in this year’s National March for Life May 12. Even though Campaign Life, the national political arm of the pro-life movement, remains the sole organizer of the march, the promo video released March 14 includes groups such as WeNeedaLaw.ca, the Association for Reformed Political Action (ARPA), educational pro-life groups such as LifeCanada, the Canadian Conference of Catholic Bishops, Priests for Life and 4MYCanada. 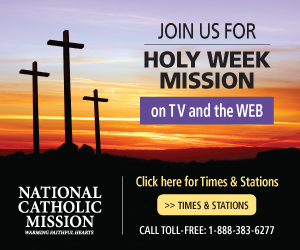 The promo can be viewed at Marchforlife.ca. The march is one of the only opportunities every year where abortion is guaranteed a headline. “We are grateful to Campaign Life Coalition for hosting this event and will do what we can to build support for it,” said WeNeedaLaw.ca director Mike Schouten in an e-mail. 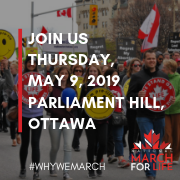 The events connected with the National March for Life start with a vigil May 11, pro-life Masses and church services the morning of the march, the march itself beginning at noon on Parliament Hill, followed by the Rose Dinner. On the following day, march organizers host a youth conference attended by about 700 high school participants. The speaker for the Rose Dinner is the founder and president of Culture of Life Africa, Obianuju Ekeocha, who will also address the youth conference the next day. A Nigerian who lives in Britain, Ekeocha became well-known in pro-life circles for her open letter to Melinda Gates over $4.6 billion in funding for contraception. “We thought it would be timely to have her here, because the Liberal government has said they wanted to use the maternal health initiative to fund abortion overseas,” said Brownrigg.